Unplugged. Uncompromising. It�s never been easier to go wireless and sound like a pro. Shure PGX Wireless brings the superior sound of Shure Microphones together with innovative automatic setup features in nine easy-to-use packages. Durably constructed, with 12 compatible systems (multiple bands) and included carrying case, PGX is the perfect system for performers on the go who want worry-free performance, every time. Shure PGX systems feature patented Audio Reference Companding for crystal-clear sound beyond the limits of conventional wireless technology. * Reliable system for spoken word applications. Designed to meet the needs of traveling performers, Shure�s PGX1 can be used with headworn, lavalier, or instrument microphones, or with guitars or basses. 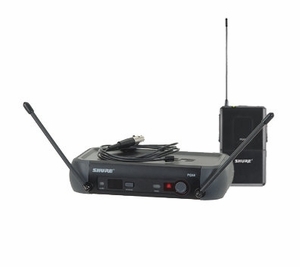 Shure�s PGX4 receiver makes wireless setup a snap. With features like Automatic Frequency Selection and Automatic Transmitter Setup, the PGX4 offers the best in wireless to performers on the go.